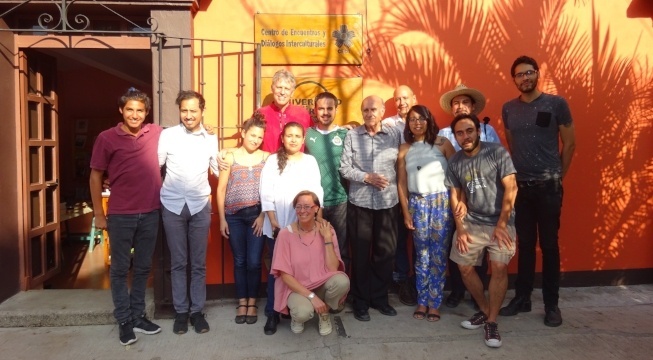 In March 2018, Pachamama Alliance Community members from different states in Mexico convened in Oaxaca, Mexico to share tools for effective planning and implementation, inclusive communication, coordinated action, and to be with one another in a creative and collaborative space. Heidi Pohl from the Pachamama Alliance Community in Colombia, called Tierra Corazón, offered an introductory training to the Theory U from the Massachusetts Institute of Technology’s (MIT) Presencing Institute. Similar to Pachamama Alliance’s educational programs, the Theory U also examines the three “divides” of our society—environmental sustainability, spiritual fulfillment and social justice.— The workshop proposes a methodology for staying present with others, especially as one commits to being a catalyst of transformation in the world through collaboration with others. It also invites participants to re-examine themselves as individuals and as community as the first step to being the leaders of the emerging future. Throughout the workshop participants practiced new depths of listening, staying present as well as Social Presencing Theater; all together a methodology for understanding current reality and exploring emerging future possibilities for action. Erik Friend, Pachamama Alliance partner, president of Fundación Comunidad, and Coordinator of the Pachamama Alliance Community in Mexico organized this community gathering at Universidad de la Tierra (Earth University) in Oaxaca. Unitierra was born as a coalition among indigenous and non-indigenous civil organizations in response to an undermining attitude from the national educational system toward indigenous ways of educating. Unitierra is immersed in processes of political and social change that explore the creation of innovative political, technological and cultural alternatives for society. Pachamama Alliance Community members in Mexico represent an inspiring commitment to strengthening a national growing network of game changers. They are open to and actively seeking dialogue with anyone interested in, or who has a role in changing the systems affecting their country. Members are experts in different fields of action that include working with young people, community building, education, water rights, entrepreneurship, etc. In the area of water rights, community member Juan Manuel Ledón was instrumental in launching the Comisión de Hábitat, Medio Ambiente y Sostenibilidad; an initiative that brings together members of the civil society and the government to hear each other, study, present and propose policies and solutions for an urgent national matter: arsenic and fluoride contaminated drinking water. In the last two years, dialogue between all parties has resulted in the implementation of a pilot program that seeks to provide access to unpolluted water in San Luis Potosí, Mexico and a new pilot is set to begin this year in the State of Morelos, Mexico.